The application format is made available in website from 04.08.2018 to 14.08.2018. The eligible candidates can make application through online for recruitment to the backlog posts of Secondary Grade Teachers (Urdu Medium) in Government, Zilla Praja Parishad, Mandal Praja Parishad Schools and Municipal schools in the state. 2. District-wise vacancy position is given below. AGE: Applicant must have completed the minimum age of 18 years and must not have completed the maximum age of 47 years in respect of BC/SC/ST candidate as on 1st July 2018, and in respect of Physically Challenged candidates the maximum age limit is 52 years. Upper age for Ex-service Men -A person, who worked in the Armed Forces of the Indian union, shall be allowed to deduct the length of the service rendered by him in the Armed Forces and also three years from his age for the purpose of the maximum age limit. Note:-As per G.O.Ms.No.182 GAD Dt.04.12.2017. Qualifications: SGT(Urdu) Post qualifications as prescribed in G.O.Ms.No.38, Edn., dated:19/11/2014 are given in the Information Bulletin. Written Test:-The candidates shall appear for written test in the centers allotted to them. The candidates shall apply through online after payment of fee and generation of reference ID. After filling online application, printout should be generated. Candidates should submit all the relevant certificates (hard copies) with self-attestation along with signed printout of application form to the District Educational Officer concerned. The last date of filling online application form is 14.08.2018 and the last date for submitting printout copy with self-attestation certificates will be 30.08.2018. It may be noted that Hall Ticket shall not be issued unless online application form is filled by the candidates and printout is submitted to the District Educational Officer concerned. Hall tickets will be issued to the candidates based on the data furnished online. Hence mere issue of Hall Tickets and writing of examination does not confer any right regarding eligibility. Any irrelevant/wrong information/fake certificates found at any stage the candidates will not be considered and are liable to be debarred for all future recruitments besides liable for prosecution as per law. The standard of questions for the examination will be at intermediate level for SGT (Urdu). 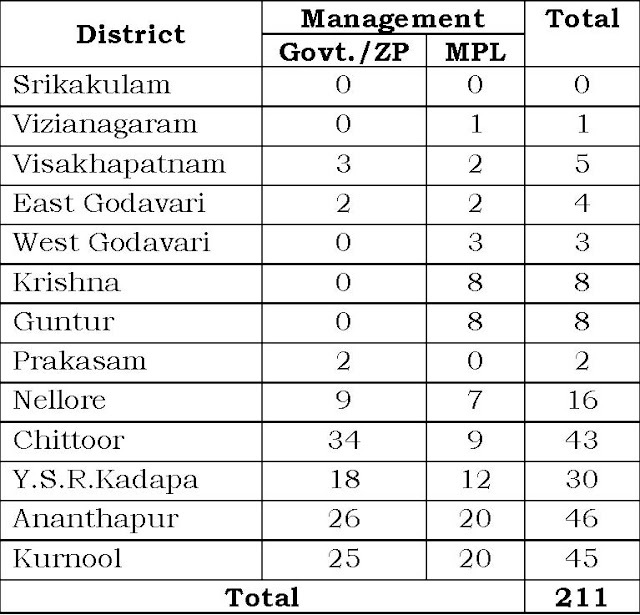 After selection, candidates can opt any of the management like Govt./ZP/Municipality as per vacancy available with concerned category roster point. The candidates applying must be fully qualified for the post applied for and in possession of all Certificates as on the last date prescribed in the notification for submission of applications. Eligibility for SGT(Urdu) Post, reservations, mode of selection, pattern of examination including duration, total marks and qualifying marks and other procedure to be followed in selection are as per G.O.Ms.No.38, Edn. Dept., dated:19/11/2014 and as per Govt. Memo No.14846/Exams/2014, dated:02/12/2014. Candidates are advised to go through this G.O. and Govt. Memo thoroughly before payment of fee and filling the applications to know their eligibility. The candidates who have passed SSC Examination in the Urdu medium of instruction or with Urdu Language as First Language are eligible to apply for the posts of SGT Urdu. The candidates who have passed the Intermediate/Degree Examination (Academic) with Urdu as language /Medium are also eligible to apply for the posts in Urdu medium. The SSC in Urdu medium completed before going for higher examinations will only be considered. The SSC completed in Urdu medium after completion of higher exams will not be considered. The number of candidates selected shall not be more that the number of vacancies notified. There shall be no waiting list and posts if any unfilled for any reason whatsoever shall be carried forward for future recruitment. The syllabus prepared for SGT(Urdu) Post Limited Recruitment Test-2018 is hosted in the Website (http://cse.ap.gov.in). The candidates may download and prepare themselves accordingly. The syllabus/topics given are only suggestive/indicative but not exhaustive.